Eight leading local authorities recently met to showcase the different ways they’re supporting vulnerable residents. Some of Policy in Practice’s clients attended the latest LIFT Dashboard User Group in Westminster to share successes since the last user group, and to get ideas and encouragement to help them deliver their next projects using the insights from their household level datasets. Attendees spoke of successes they’ve achieved by proactively identifying vulnerable households and then targeting bespoke support accordingly, using their LIFT Dashboards. 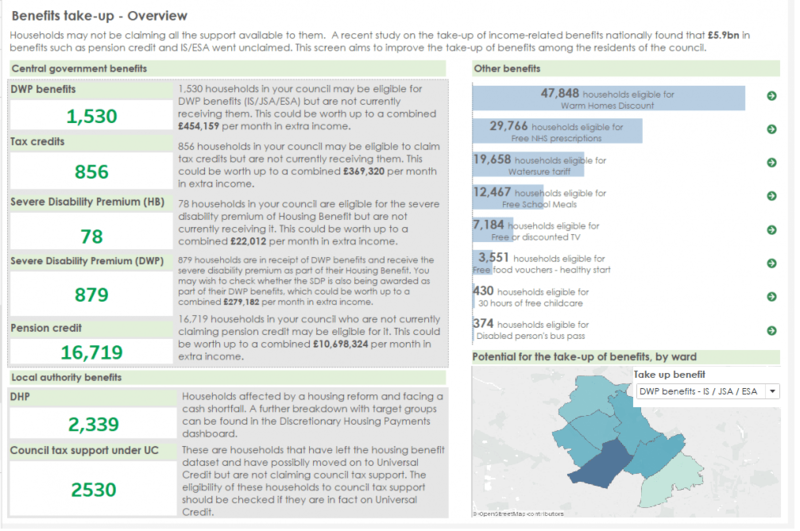 Important patterns and links that exist within datasets are shown visually to drive insights that have enabled these councils to achieve a range of varied objectives. The Benefits Take-up screen within LIFT was launched and shared with some councils late last year, in response to a request from a client who wanted to quickly identify which households are eligible for benefits that they’re not already claiming. All clients will have access to this screen after their next data refresh. Corin Hammersley of The Royal Borough of Greenwich has led a benefits take-up campaign using this screen. Her strategy has been to focus on those who are eligible but are not yet claiming Severe Disability Premiums. This benefit is worth £64.30 per week for a single claimant and £128.60 for a couple who are both eligible, which could make a significant impact on household finances. This campaign is especially timely given that households who are eligible for the Severe Disability Premium will be protected by managed migration. Households who migrate before discovering their eligibility won’t receive this protection and will be eligible to backdate their claim for up to only one year, while others can backdate to the date at which they became eligible. Corin spoke more about how she has used the dashboard to drive timely and effective take-up campaigns on a recent webinar, click here to watch. Luton Borough Council has worked with Policy in Practice and the UsCreates team (Now FutureGov) to build a trailblazing homelessness prevention strategy. 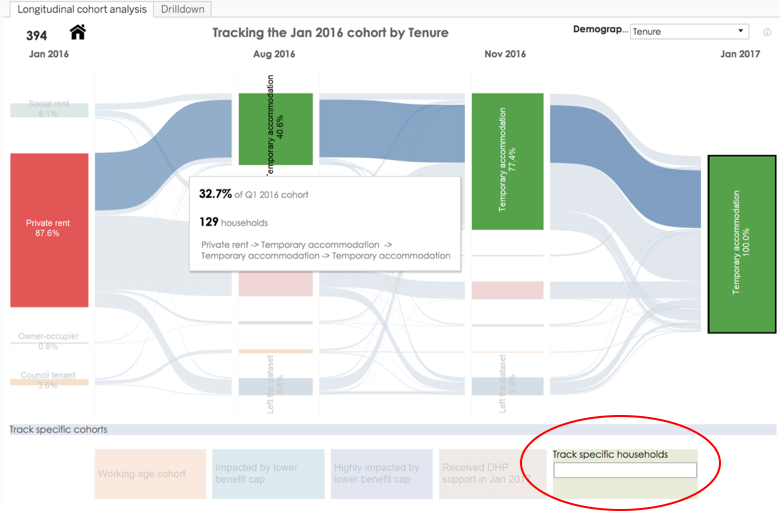 The team uses the LIFT Dashboard to identify trends and prioritise households for homelessness prevention support, including households in the private rented sector who have a cash shortfall now, and those who are predicted to face a shortfall in 2020. 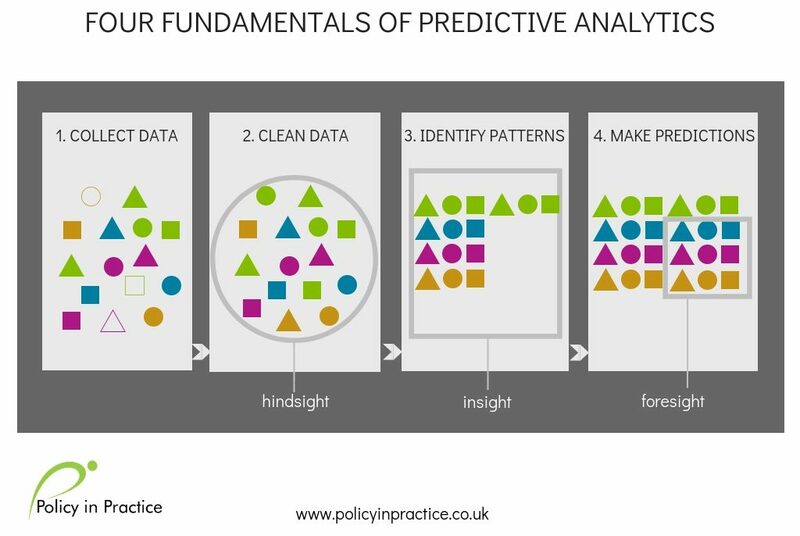 Key takeaway: Luton is leading the way on predictive analysis with the LIFT Dashboard. A recent campaign identified 41 unemployed households with children who had a cash shortfall but no DHP had been awarded. These households were then contacted over the phone, in a bid to increase weekly income through employment advice. Proactive engagement such as this is valuable in preventing arrears and homelessness. The team at Luton envisage contacting 400-500 people, not just for homelessness prevention but also for targeting food bank support and poverty prevention. We will continue to work in close partnership with the team in this endeavour. Learn more about Luton Borough Council’s homelessness prevention strategy here. Tower Hamlets Council has used the LIFT Dashboard to reinvigorate their DHP policies: they want to prevent homelessness rather than simply to top up unsustainable tenancies. Social tenants in rent arrears who are identified as having a cash shortfall are prioritised according to household characteristics. They are then tracked within the dashboard’s Track your residents function, while receiving a DHP, to see how well it is building a sustainable improvement. Tower Hamlets was also one of the many cases where the LIFT Dashboard has supported external grant applications. They have been able to demonstrate and evidence-based approach by identifying and tracking the outcomes of pupils on free school meals, and women who have been supported into work. This evidence based approach has helped demonstrate the value of the LIFT Dashboard work to partners and councillors, helping to build a strong case to secure future funding. Cornwall Council is undertaking a small scale project to support fewer than 100 families across the private rented sector, as well as those being supported by Cornwall Housing and external employment support partners. Private tenants are identified using the LIFT Dashboard according to their financial resilience and the impacts of welfare reform. The council has used the dashboard to identify and target support while ensuring that resources are not wasted through duplication. The Poverty Action Steering Group tracks interventions to ensure that new campaigns prioritise those in need who have not yet engaged or received support. In this way, the LIFT Dashboard is supporting project management at a time where resources are increasingly stretched. Barking and Dagenham Council are working towards the multidisciplinary use of the LIFT Dashboard to provide holistic support. Their vision is to bring together the work of social care, homelessness prevention, employment support, revenues and benefits and housing organisations using data insights. While internal processes can prove challenging to change, the Digital Economies Act and other information sharing legislation has been used to support the project. The duty of care to support vulnerable households with the data held by the council has provided a springboard for proactively engaged support across teams and with arm’s length organisations. An early example of the success of this approach has been seen in the community food hub which has been built in an area where at-risk households were identified in the dashboard, and households identified as in need were contacted to maximise engagement. Haringey Council and Homes for Haringey, an arms-length housing association, have also worked to support vulnerable residents using the LIFT Dashboard. The Community First Programme, set up with this data-led collaboration in mind, aims to prevent spiralling council costs by referring users to support prior to a crisis. At the moment the project currently operates as a walk-in service but the teams will soon actively contact identified households, based on agreed selection criteria, using the LIFT Dashboard. We’re working closely with Haringey Council and Homes for Haringey to embed the LIFT Dashboard into their processes. The Dashboard promotes an evidence-based and systematic approach to outreach, because we know through other councils that it is most effective when embedded as part of the day to day functioning of the council. More frequent data refreshes. Typically datasets are updated quarterly which, as councils move toward a data-led approach, has been frequent enough. We are now working with two of our clients to deliver monthly dashboard refreshes, and aim to embed this in our standard processes during this year. The means clients will be able to act on more timely data, and we’ll improve the efficiency of our data extracting and transferring process. Discussion forum. Users wanted an ongoing way to discuss solutions to shared objectives, view posts from previous users and learn what was most effective. A digital forum for participants, such as an online hub, would allow people to participate on a voluntary basis and could save users time in searching for advice. Data availability. Clients wanted to know how to prepare for the loss of data on low-income residents as Universal Credit rolled out. Councils can currently access about 40% of their Universal Credit caseload through LIFT Dashboard. We’re working with people across government to make the case for the broader use of data. The concern is that proactive support will need to give way to reactionary measures which cost more and help fewer households. We’re asking DWP to make more of their Universal Credit data available to local authorities in an open letter which you can sign here. Other developments we are working on include our new Child Poverty screen, in-built action plans based on successful campaigns run by other clients, and a screen on temporary accommodation. Contact us at [email protected] if you’d like to hear more about these plans now or request a look at a LIFT Dashboard. Our next steering group takes place on Wednesday 19 June at our Millbank Tower office in Westminster. Find out more and reserve your place here.